We picked the little Island Koh Mak as our last beach destination before we are headed back to Bangkok, where our flight leaves to Germany! 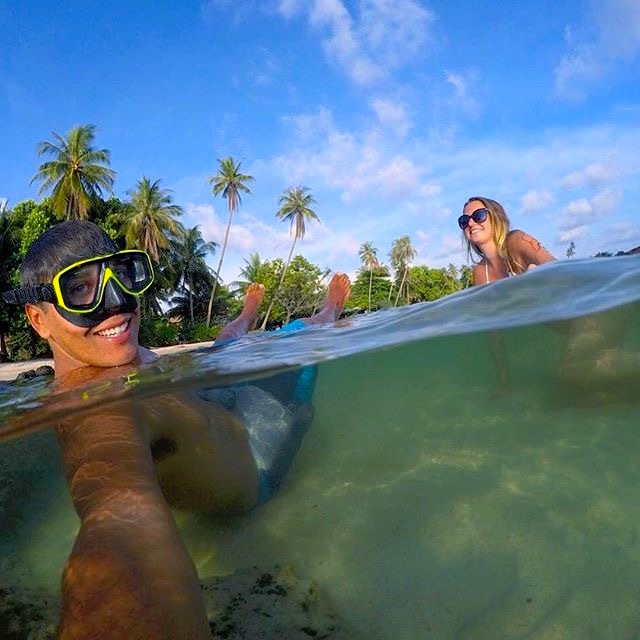 Koh Mak is about 190miles away from Bangkok and is located between Koh Chang and Koh Kood! Thanks to the Ao Kao White Sand Beach Resort for a great time! 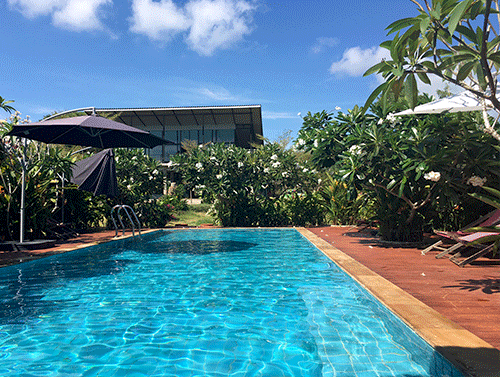 We stayed at the beautiful Ao Kao White Sand Beach Resort, which is a incredible resort and we can highly recommend it to everybody who plans to visit Koh Mak! 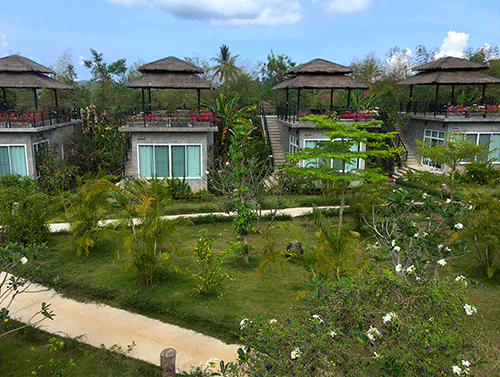 Let me show you around the Ao Kao White Sand Beach Resort. The Ao Kao resort is just perfect! The bungalows are very very nice, really big, super clean, furnished with a big bed, a sofa with a table and a TV! The bathrooms are huge as well and it is enough space to spend a great vacation there as a couple of as a family! The Ao Kao Resort has everything you need for the perfect vacation: a great pool, a private beach, tennis court, a beach bar, kayaks to rent, scooters, which you can take around the whole islands and much more. At arrival the staff served us a delicious welcome drink and handed us a map of the island and explained where all the good sights are. They showed us our bungalow which is in a beautiful lush garden! They arranged the flowers on the bed to spell out “welcome Ina“, which I think is so cute and shows how much love they put in the resort to make the guests happy! I’ve never seen that before, so I was really surprised about this lovely gesture! We immediately fell in love with the incredible rooftop, which every bungalow has! The view was amazing and we loved to relax there on the lounge chairs. Because there is a roof on top, you can relax in the shade. 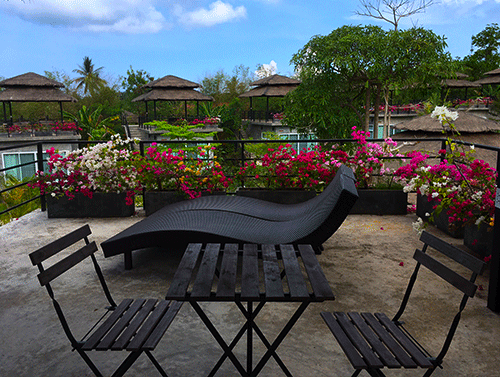 There are so many pink flowers and the whole resort and garden is very well maintained. We ate many times at the Ao Kao Restaurant, which served super delicious food. The breakfast was included and very tasty. 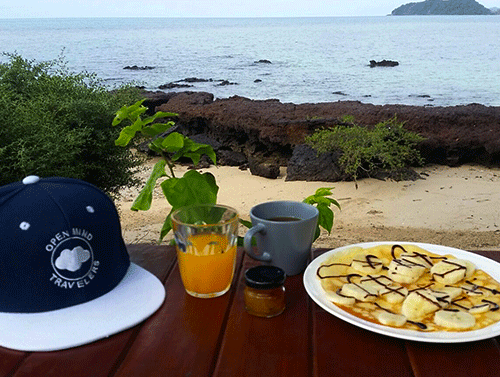 The staff prepared fresh scrambled eggs or omletts as well as my favorite pancakes with banana and chocolate sauce. We could sit right at the ocean with a view of the surrounding islands. A speciality was the homemade fruit jellys, which we loved with our toasts. 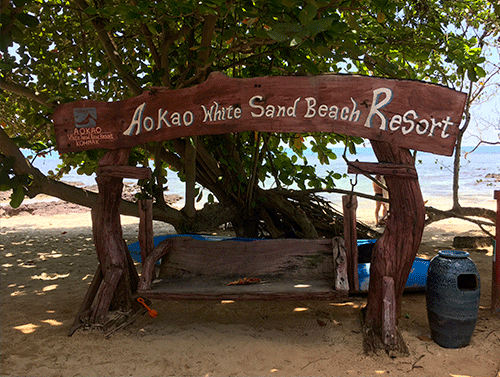 We really enjoyed every single day of our stay at the Ao Kao White Sand Beach Resort. The weather was perfect, so we had the chance to explore the island by scooter as well. We had fun times in the clear water, snorkeling and enjoying our last days at the beach for the next couple of month! This Resort is awesome and we can highly recommend it to you! We hope we will be back there soon!